RORY PATTERSON reckons Derry City are more than capable of knocking the league’s big spenders off their perch and prove last season’s third placed finish was no fluke! The experienced hitman bagged 20 goals in 32 appearances last season to help fire the Candy Stripes into the UEFA Europa League and two cup semi-finals as Kenny Shiels’ troops proved the surprise packages of 2016. Written off as relegation fodder, Derry finished comfortably ahead of Shamrock Rovers in third on 62 points - their highest tally since 2011 when they also finished third. And with the hotly tipped Rovers and Bray Wanderers splashing the cash in pre-season, alongside Dundalk and Cork City, the pundits are once again dismissing City’s chances of breaking into the top three. Priced at 16/1 fourth favourites behind Dundalk, Cork and Rovers to win the title, Patterson wasn’t surprised to find his side down the pecking order when the pre-season predictions were made. But the striker expects Derry to quietly go about their business and hopefully clip the wings of the ambitious Seagulls and resist the advances of the Rovers revolution - two teams seeking to usurp City in the race for Europe..
“It’s the same every year. Shamrock Rovers are always spoken about like they’re the best team in the land but I can’t remember them winning much recently and obviously we finished above them last year,” said Patterson. “We will just get on with our own job. If people want to put them up on a pedestal then they’re up there to get shot at. Dundalk and Cork are the strongest financially and probably have two teams each, squad-wise. But we’ll just go about our business like we did last year and if we stay under the radar and get a good start then all well and good. City’s talisman came so agonisingly close to clinching the Premier Division’s golden boot last season only to be pipped to the prizeby Cork City’s Sean Maguire on the final day. It must have been pretty hard to accept given he could so easily have added to his 17 league goals (although he was only credited with 16 by the FAI) against St Pat’s at Richmond Park where he netted a brace and struck the woodwork! I’m a bit long in the tooth to be chasing after things like that (the golden boot). Those kind of accolades are nice and the younger you are the more you appreciate them. His haul was just one short of Maguire’s tally but the former N. Ireland international insists he’s no longer driven by personal accolades. The 32 year-old Strabane man, who finished as the league’s top marksman in 2013 with 18 goals, is currently on 81 goals for Derry City from his two spells at the club and could reach the century mark this campaign should he repeat his heroics from last season. And while he’s happy to carry the burden of supplying the goals for the club in 2017, he’s also prepared to step aside in the goalscoring stakes and turn provider should it mean the Candy Stripes can bring some silverware to the club. Indeed, Patterson says he would be more than happy to become the supply line for the likes of Mikhail Kennedy, Ronan Curtis and Nathan Boyle as long as it means winning games. 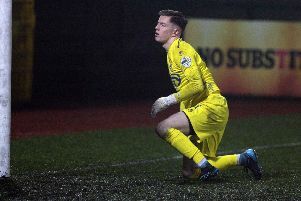 City were perhaps over reliant on his goals last year and he’s already been firing in the goals in pre-season, netting against RKSV Leonidas during the trip to Rotterdam, a second half brace against UCD in a 3-0 win in Dublin and against Dergview in the final friendly fixture at Maginn Park last Monday. “I’m a competitive person. I don’t need much to motivate me. Obviously if I’m on the pitch I’m there to do a job and that’s to score goals and hopefully that leads to us winning games. I scored a few winners last year which is my job. I don’t set myself a target. If the ball’s there to be put in the net then I want to be there to do it so hopefully a few chances come my way and I can be there or thereabouts this year again. “But I’m a bit long in the tooth to be chasing after things like that (the golden boot),” he claimed. “Those kind of accolades are nice and the younger you are the more you appreciate them. “However, I’m in it to win games and I’m obviously hoping that leads to silverware. If that means me sacrificing a few goals and chipping in for other players in the team, and we get silverware, then that would make me happier than picking up the top goalscorer award. Having reached the heady heights of the Europa League places against all odds does Patterson think it will be harder to replicate that performance this year? “We have enough experience in the team to deal with expectation but obviously we don’t want too much pressure put on the young boys. For most of them it’s their first full season. They’re well equipped but I just wouldn’t be looking too far ahead as we’re still a bit light in squad terms. “However, all going well, fitness-wise and suspension-wise, and if we can keep a consistent 11 on the pitch, then there’s no reason why we can’t be up there challenging. “You obviously need a bit of experience. I have to chip in with my bit and pass on whatever knowledge I can to the boys who are coming in with no experience. Sometimes that can be a good thing as they can go out with no fear and express themselves. But if you have a couple of experienced heads looking to help them through then that’s going to help. City face a tough start to the campaign against Bohemians at Dalymount tonight and while Shiels’ men enjoyed the upper hand over the Gypsies at the venue last year, Patterson is expecting a real test of their credentials. And with three teams going down this year does he think it will be tougher to get a result against those teams expected to be scrapping for survival? “It’s always a tough place to go. “I don’t think three going down is going to make it any more competitive.